Iberian ham is a unique product, with an extraordinary taste that has earned it worldwide recognition. That's why Enrique Tomás we make sure that every piece of ham or ham shoulder that reaches our consumers has the maximum excellence, offering a selection of Gran Reserva, Iberico de Cebo, Iberico de Bellota and Bellota 100% Iberico (pata negra) hams or ham shoulders of extraordinary quality. What kind of piece to choose? In our online shop you can choose from the best pieces of ham and ham shoulder to enjoy a unique product at home. 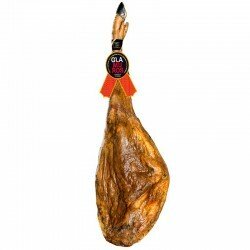 The Enrique Tomás Gran Reserva ham has a curing process of approximately 18 months. This longer curing process than that of the majority of "Serrano" hams that you will find on the market, together with a careful process of elaboration by the expert, makes our Gran Reserva a delicious ham that you can enjoy every day. In the elaboration of the Iberico de Cebo ham, the work of the expert is very important to achieve a delicious final result. The quality of the ham will be determined by climatic conditions and a careful curing process of approximately 24 months, among other factors. The most characteristic feature of this type of ham is the marbling that makes it more appetising, elaborate and full of nuances. The Iberian ham, besides being exquisite, is very healthy, so we recommend you include it in your diet without hesitation. Iberico Bellota ham is the jewel of ham in terms of quality and flavour. As its name suggests, it comes from the hind legs of an Iberian breed pig that has eaten acorns during the fattening season. Intense and tasty (marked in our catalogue with the letter P and the colour orange). The Pedroches Denomination of Origin is the most recent and includes a series of towns in the Pedroches Valley, located to the north of Córdoba. The difference in flavours in the different origins is due to factors such as climate, humidity and the native methodology of the area. The term "pata negra" ham (100% Iberian acorn-fed ham) refers to the highest quality hams from 100% Iberian pigs reared free-range on acorns and natural pastures in the montanera-Season. At Enrique Tomás we guarantee that you will buy the ham you buy and in the format you choose it will be a ham that you will like. Through our seal of total quality assurance, we certify that we have carried out the necessary controls at all stages of production of the ham so that it reaches you in the best condition and at the optimum time for consumption, with the perfect ripening point for you to enjoy its flavor at home. And to guarantee that you can enjoy fully a delicious product, we offer you our service of machine cutting or knife cutting so that your entire piece does not become a headache for you. Our professional ham professionals will make you enjoy this exquisite product simpler than you think. Find the whole piece of Iberian ham you are looking for and make your purchase in just minutes.